The garden office was bought from these jokers who have a good pedigree and were selling for the right sort of price (our 14'x10' insulated, double glazed shed cost £4,500 initially). I'm not sure but I think they're having staffing issues and personal issues at the moment though and that badly affected their work. I also think garden offices is a relatively new venture for them so their experience in sorting problems was limited. The photo shows the main problems we've had which to my untrained eye seems to be creeping damp. The shed is sat on a concrete base which does hold water (in the way that concrete does), but the office is mounted on runners, so you'd imagine it wouldn't matter. This damp has now crept on three of the four walls and there's also a spot on the roof. We've sacked the company now and paid them a percentage of the total and they're happy just to skulk off into the background. We've now got a builder who says that he thinks all of the issues are caused by water evaporating from the floor and rising into the walls. There's currently nothing to stop it and because the rest of the shed is so well insulated the water can't get out. He says that the nuclear option he's going to apply is to lift the shed and line the base with an impermeable membrane, so even if water evaporates up then it shouldn't get into the shed. And that's hopefully it, but I'd certainly appreciate any thoughts you may have. This poor person is a very good example of being used as a shed company's guniea pig! 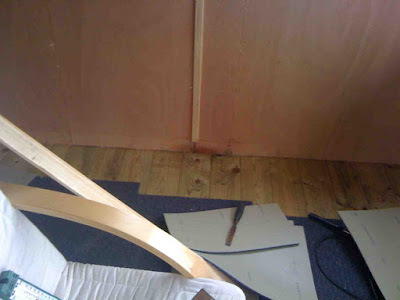 A bit of moisture in a shed is no major issue - in an office environment it's a total disaster. It's hard to make out from the photo, but I would anticipate that this problem is as much from water "curling" around the bottom of the outerwalls as from it creeping up through the runners. Check to see if there is a drip groove along the underside of the exterior walls (this breaks the run of the water ... and makes it drip outside, and not ingress) If there is not one there - then that's your problem. It's not a simple fix to retro fit a drip groove I'm afraid, but your builder friend may be able to solve this by adding a spreader baton to the bottom of the walls - which will push the water away. Most reputable garden office manufacturers should include either of the above in their specification. It's a shame these goons didn't. I'm the sap who bought off this particular company! It's taken nearly 2 months of sorting but it's looking like we're getting there. Finally! Kudos to Shedworking and your readers, for your support in getting this sorted! And yep, David, you're dead right if you spend £45k on a shed you're going to end up with a better product. It's probably a bit too obvious to say that 4.5k was all I had to spend tho. We fit a damp proof course on top of the pressure treated floor and wall bearers then any damp will not rise through this layer. Having the cabin raised on pressure treated floor bearers also provides an air gap which helps with circulation beneath the cabin floor. In terms of retro fitting short of picking the whole thing up I would look at improving air circulation beneath the existing floor.